Attention Bidders: Please take note that there is a 12.00% Buyers' Premium on all items purchased through this site. 12.00% of the winning bid will be added to the final sale to cover a portion of the fees associated with the auction. This total will be visible on your invoice prior to making payment. This painting was created on stage by world renowned performance artist David Garibaldi on February 23 2019 at Fed Ex Forum in Memphis prior to the final performance by KISS on their "End of the Road" tour. The 5ft by 8ft stretched canvas painting was created with the speed and precision that only a master painter like Garibaldi could create in front of 15,000+ fans. 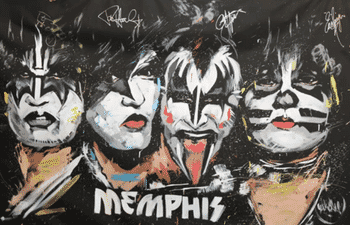 Only one Kiss painting was created for Memphis, immediately autographed by David Garibaldi using is signature "hand print", then autographed by Paul Stanley, Gene Simmons, Eric Singer, and Tommy Thayer of the legendary KISS back stage. Truly, one of a kind! 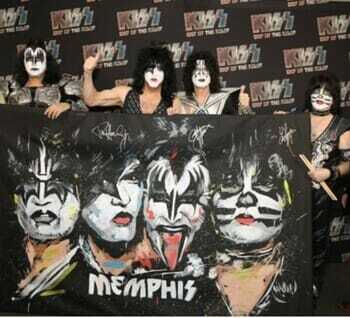 With your tax deductible bid, you can own this autographed piece of KISS-tory with 100% of net proceeds going to St Jude Children’s Research hospital. Bonus: Winning bidder will also receive 2 Graceland Ultimate VIP Tours valued at $348! The bidding begins Monday Morning, April 2nd at 6am, and ends Sunday April 14 at 10pm. The person with the highest bid at the close of the auction will receive the canvas painting by David Garibaldi that is signed with his signature "hand print" and autographed by 4 members of KISS. *Winning bidder will receive a Print on Demand certificate at the end of this auction. This certificate will be used to pickup this painting at WATN-TV in Memphis. **Station (WATN-TV) is not in any way liable for delivery or shipping of item, locally or otherwise. If bidder is not able to pick up the item at the station, accommodations for all delivery and/or shipping, packing and insurance can be coordinated with the station and the winning bidder. However, all packing, shipping, shipping insurance, shipping arrangements and expenses are the sole responsibility of the winning bidder. It is also the sole responsibility of the winning bidder to claim the item. The station also assumes no liability for damage to the item after it leaves the station premises. ©2019 NeoFill® /Nexstar Broadcasting || Proudly powered by the NeoFillBids Online Auction Platform.